"I just love the Reuben sandwich so I wanted to create a casserole version. It turned out delicious! My son came home from football practice and brought a friend who dove into it as soon as he saw it. Yum! I served it with some steamed green beans and coleslaw mixed with thousand island dressing and toasted, buttered rye bread." Place torn rye bread into a food processor and pulse several times to make crumbs; combine rye crumbs with panko crumbs in a bowl and set aside. Bring a large pot of lightly salted water to a boil. Cook egg noodles in the boiling water, stirring occasionally until cooked through but firm to the bite, about 5 minutes. Drain noodles and set aside. Melt 3 tablespoons butter in a large saucepan over medium heat; cook and stir onion until lightly browned, about 15 minutes. Season with salt and black pepper; stir in brown mustard. Remove from heat, stir in flour until smooth, and gradually whisk in milk. Sauce will thicken. Whisk 1 1/2 cup Swiss cheese into the sauce, stirring until the cheese has melted and the sauce is smooth. Stir sauerkraut with about 1 tablespoon of reserved juice and corned beef into the cheese sauce. Transfer cooked noodles to the prepared casserole dish and pour in the sauce; stir to combine. Sprinkle remaining 1 1/2 cup Swiss cheese in an even layer over the top. Bake casserole in the preheated oven until bubbling, about 20 minutes. 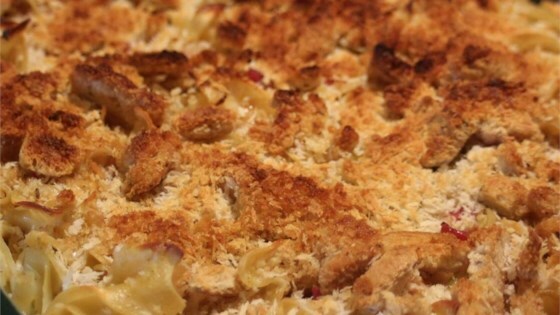 Remove casserole from oven and set the oven to broil. Stir 3 tablespoons melted butter into the reserved rye and panko crumbs until thoroughly combined and sprinkle top of casserole with rye crumb mixture. Return to oven and broil until the crumbs are golden brown, about 2 more minutes. Watch carefully to prevent burning. I served this with Thousand Island dressing to drizzle on top. Really good. This recipe turned out really good! I need to use a bigger dish next time. This was really great. I served it with a ham, so omitted the corned beef. I am sure to make it again and the next time the corned beef will be in there. Thank you for a tasty clever meal idea!